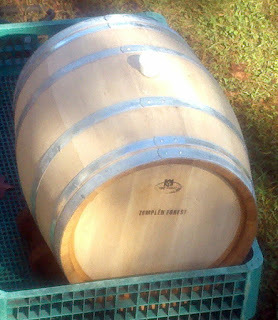 For the larger volumes of wine I am starting to make, I am starting to purchase larger-sized barrels. Prior to this, I used oak chips and spirals, and also had one small barrel. My first large barrel was delivered and sitting in the driveway when I arrived home from picking up the Zin and Barbera grapes in Durham. What a pleasant surprise! It is a 32-gallon Vadai Hungarian Oak Barrel. I've been very happy with the 8-gallon Vadai barrel I purchased earlier this year, so I think I am going to stick with them. Not only do they provide great flavor enhancements, but they are economical. To give you an example, a $275 32-gallon Vadai barrel is much more affordable than a $480 29-gallon French barrel. This barrel will first be used to store the 2010 NC Syrah. With this size barrel, I believe I will be able to leave the wine in it for a full year. But it is important to taste regularly to make sure the wine doesn't become over-oaked. Right now I have it outside to hydrate since the weather has been warm and dry. It should finish hydrating this week so I can fill it over the weekend. Nice choice! I have a 40L (13 gal.) Vidai. It's time for me to move up to something like your's.